Hey there! Thanks for dropping by animelondon! Take a look around and grab the RSS feed to stay updated. See you around! Once again Hobby Japan brings another of it’s series of poorly clad characters to life but having a storyline to bring to life would have been better. 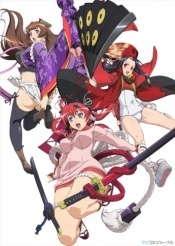 See what our band of reviewers thought of Hyakka Ryouran: Samurai Girls.